Ah finally! The sun is shining again after weeks of depressing deluges, the heat has rocketed up, and I want to eat salad. So here are a couple that you might like. 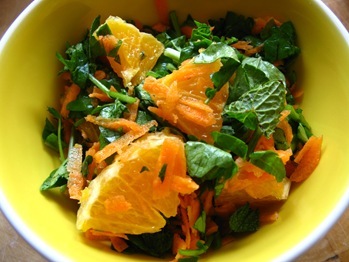 They’re very easy to knock up, and contain lots of different mouth-popping flavours - my favourite current obsession is to put fresh pieces of orange in everything, which contrasts nicely with salty or strong ingredients. My standard vinaigrette recipe will work well with both salads – I use a ratio of 3 parts extra virgin olive oil to 1 part vinegar (a mix of half balsamic vinegar and half red wine vinegar), a teaspoon of Dijon or grainy mustard, a few grinds of black pepper and a little squeeze of lemon juice. Just mix everything together in a cup and whisk with a fork until emulsified. Peel the orange then cut the whole orange in quarters. Slice up each quarter into segments, removing excessive pith. 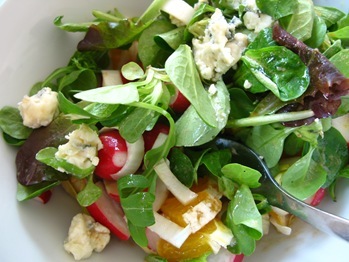 Slice the chicory into rounds, then place in a bowl with the orange, sliced radishes, mixed salad leaves. Crumble the Roquefort over the top, then drizzle with the vinaigrette. C’est pret! Peel the orange then cut the whole orange in quarters. Slice up each quarter into segments, removing excessive pith. Throw all the ingredients into a bowl and pour the vinaigrette over the top and toss. That’s it. If you can wait before eating, it’s nice chilled in the fridge beforehand, but only on the hottest of days.